Nigel Slater, the food editor of the Observer/Guardian, still rolls out good ideas for satisfying grub. 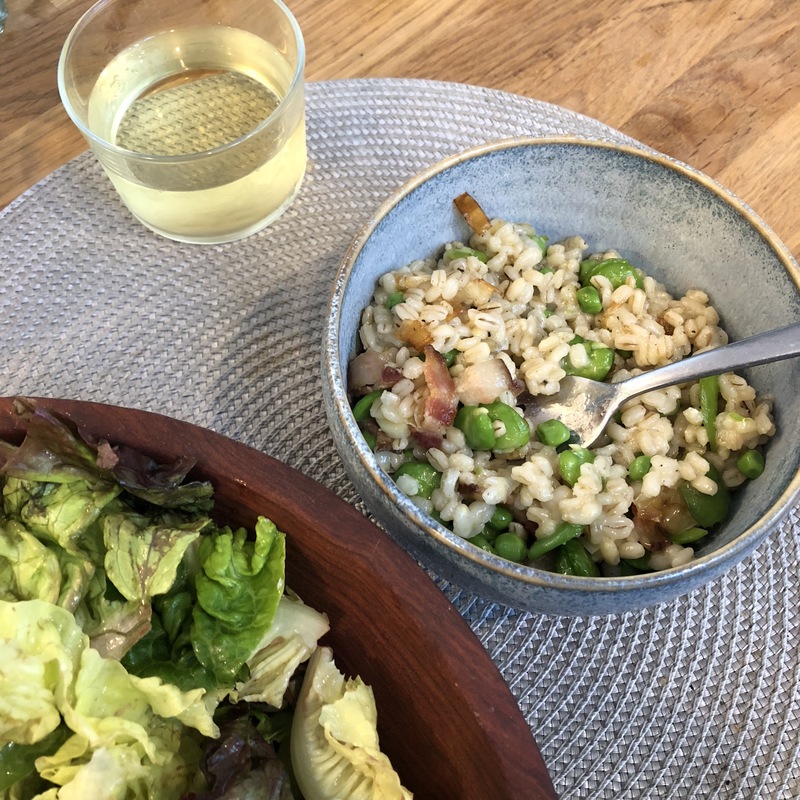 Recently, I noticed a recipe of his that calls for boiling some barley, adding it to bacon still frying in its fat, tossing in some peas, and, at the end, mixing in cubes of Taleggio cheese. I decided to adapt the recipe — easy enough — for one. I decided to make it even more Spring-like. I made just enough for dinner with enough leftover for lunch. Put a pot of lightly salted water on to boil. Add the fava beans and blanch for a couple of minutes. If you have a spider scoop, fish them out of the water and let cool. Meanwhile, add the barley to the water you’ve just removed the favas from. When the water returns to a boil, reduce the heat to medium low and cook 15-20 mins until the barley is still firm but soft enough to chew. While the barley is cooking, heat olive oil in a medium skillet and add the bacon lardons. Fry until almost crispy. While the bacon is frying, remove the outer skins on the favas and reserve to the side. Add the sliced leeks and stir to combine in the bacon fat. Drain the barley, shake off the excess water, and add it to the bacon and leeks. Add the shelled favas and the peas. Stir so that the bacon fat coats all the ingredients. Season according to your taste. When the peas and the barley are hot and well mixed with the bacon, scatter the cheese over, stir, and let it melt. Adjust the heat so that the cheese doesn’t burn. When the cheese has melted through the barley, turn off the heat. If you’re eating alone, scrap half the contents of the pan into a bowl and leave the rest to cool. I ate it with a salad. Vegetarians will omit the bacon. I imagine that olive oil on its own with a drizzle of walnut oil at the end might be very nice. from Yotam Ottolenghi and Sami Tamimi, Jerusalem, p. 109. I dreaded looking at the date of my last post. July, 2012. And now I see that the last recipe I posted was also a one by Ottolenghi. I suppose he’s been a lot on my mind. I have to confess that I went a while without cooking much. Now that the weather has cooled and I’m often writing at my table, it’s nice to have a task to turn away to when I need perspective. Happily, Ottolenghi’s terrific new cookbook has given me lots of opportunities to step away. Of the three cookbooks he has produced this one is the best, in my opinion. From the standpoint of shelf appeal, it has far more recipes that look interesting than ones that don’t. And now that I’ve tried eight of them, I can vouch for more of them than I could in his other books. Some of the recipes in his previous books erupted like brain farts. But when they worked, they were the creative outbursts of a genius mind. This time, Ottolenghi got his cookbook mojo together. To give you an idea of how appealing the book is, here are the recipes I’ve made — then I’ll describe making the risotto. The only recipe that failed to meet my expectations was the one with wheat berries. It took forever for them to soften — and I made sure to buy the ones described as soft. A friend of mine had no better luck when she tried the recipe. Otherwise, I enjoyed the others. Ottolenghi is unusual in his ability to consistently and successfully surprise home cooks. Sometimes the surprise comes in the combination of flavors. At other moments it’s the addition of one seemingly banal element that transforms the dish. Sauteing pine nuts in butter is an example of the latter kind of surprise. Buttered pine nuts is his main party trick in this volume. Try it. 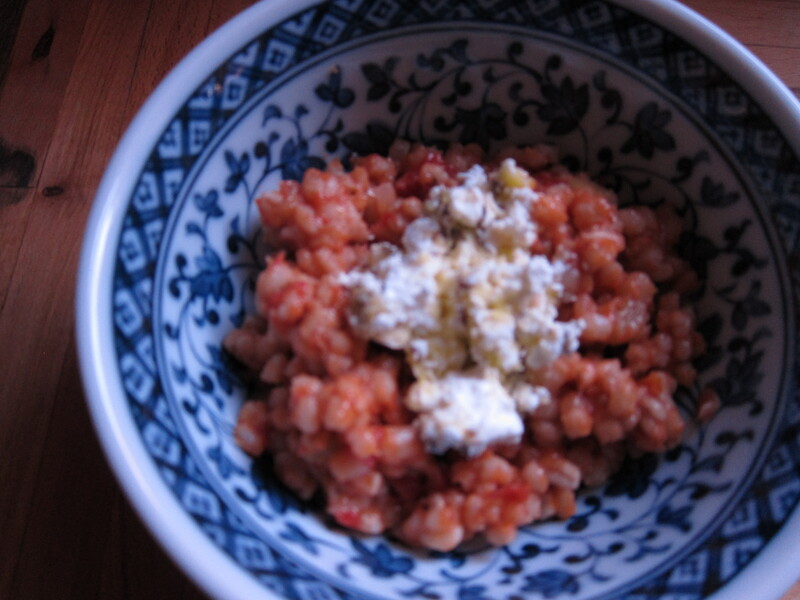 The following risotto falls into the category of Surprise Caused by Combination of Flavors: feta, caraway, and smoked paprika. To sum up, Jerusalem is well worth a pilgrimage to your nearest independent bookseller. I haven’t cooked so much from one book since… when? Ruth Reichl’s Gourmet Cookbook? Naomi Duguid’s Beyond the Great Wall? Anything by Marcella Hazan? A cookbook writer for the ages. Shadowcook: Really, Yotam? It wouldn’t have been sufficient to say “finely diced”? Shadowcook: I used pimetón. It added a lovely aftertaste of smoke — until, that is, the caraway kicked in. Shadowcook: I experimented with Aleppo pepper, but now I think red pepper flakes would have given it a firmer boost. Shadowcook: I used chicken broth. Shadowcook: Seemed unnecessary, so I left it out and I’m glad I did. The ratio of liquid to grain worked quite well without it. Shadowcook: Too much. I would cut this amount in half next time. The caraway overwhelms the paprika, lemon peel, and chile flakes. Rinse the pearl barley well under cold water and leave to drain. Melt the butter and 2 tablespoons of the olive oil in a very large frying pan and cook the celery, shallots, and garlic over gentle heat for 5 minutes, until soft. Add the barley, thyme, paprika, bay leaf, lemon peel, chile flakes, tomatoes, stock, passata, and salt. Stir to combine. Bring the mixture to a boil, then reduce to a very gentle simmer and cook for 45 minutes, stirring frequently to make sure the risotto does not catch on the bottom of the pan. When ready, the barley should be tender and most of the liquid absorbed. Meanwhile, toast the caraway seeds in a dry pan for a couple of minutes. Then lightly crush them so that some whole seeds remain. Add them to the feta with the remaining 4 tablespoons / 60ml olive oil and gently mix to combine. Once the risotto is ready, check the seasoning and then divide it among four shallow bowls. Top each with marinated feta, including the oil, and a sprinkling of oregano leaves.